Written by Josephine Cruz from Complex Media. The Brooklyn Nets will pay tribute to their team’s rich history with a set of new alternate uniforms that are a throwback to the ABA Nets’ "Stars and Stripes" kit that was worn from 1972-1976. The "sherseys"—consistent with other heritage or throwback jerseys seen in the league—are part of the official "Brooklyn Stars and Stripes" collection, and will be debuted when the Nets host the Phoenix Suns at Barclays Center on Friday, March 6. The ABA Nets began wearing the "Stars and Stripes" uniform in 1972 when they called the Nassau Veterans Memorial Coliseum on Long Island home. The six years the Nets wore the uniform saw them play in three ABA Finals, and win the ABA title twice, in 1974 and 1976. 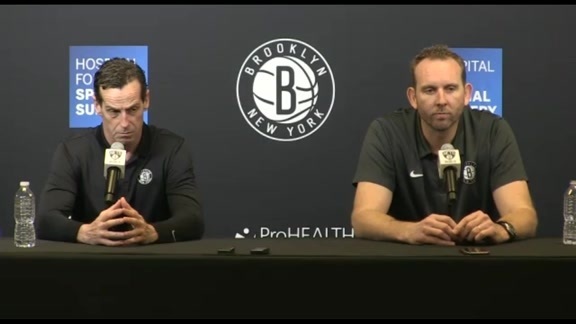 "We are proud to pay homage to one of the greatest periods in Nets history," said Brooklyn Nets and Barclays Center CEO Brett Yormark. "The refreshed 'Stars and Stripes' uniform connects today’s Nets in Brooklyn with the team’s legacy on Long Island, while also incorporating our team’s signature black and white." The "Brooklyn Stars and Stripes" uniforms, along with matching tees and hats, will be available in family sizing at the Nets Shop at Barclays Center and on NetsStore.com starting on Jan. 26. There will be additional pieces unveiled from the collection leading up to the March 6 game. A special Brooklyn Stars and Stripes five game ticket package starting at $100 will also available for purchase by calling the Brooklyn Nets Ticket Office at 718-NETS-TIX or by visiting brooklynnets.com. Those who purchase the ticket package will receive an exclusive Nets duffle bag. To celebrate the launch of the new uniform, the Brooklynettes dance team is also hosting the Fashion Face-Off design contest which will be open to fashion design students in the New York area. The winning design will be produced by David Dalrymple, who has crafted outfits for everyone from Beyoncé to Jennifer Lopez, and will be worn by the Brooklynettes in a center court performance during the March 6 game. For more information on the contest, visit the Brooklynettes website. Today, a group of the Nets biggest fans were surprised with the first look at the collection, and we were there to see it all go down. Check out some of the shots from the unveiling below, and the video above.